Today I read a blog post about 7 trends that speed up the adoption of marketing automation. It mentions the importance of valuable content, the increasingly longer sales cycles and the “consumerized” B2B sales processes. These are all important trends, and many people will wonder: how do I get started? Marketing Automation software is often positioned as the be-all and end-all. It’s as if you would just sign up with one of the vendors, take a day to set everything up, and you’re done. Unfortunately, there is more to it than just technology. 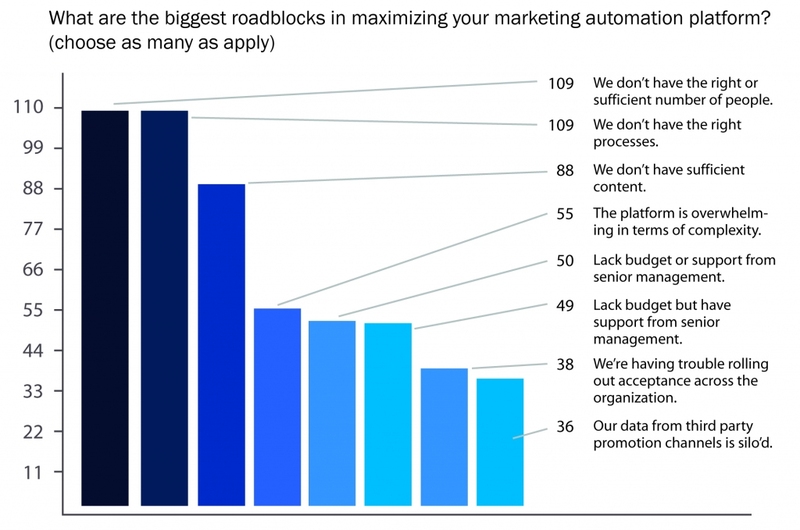 The result today: too many Marketing Automation users use their expensive system as an email marketing tool. Essentially, they changed their technology without updating their processes. The companies that are successful with Marketing Automation take a different approach. They think strategically about their sales & marketing processes. They understand the capabilities of the technology, but think “process first”. An example: they determine what their most important customer segments are, what content they need in the different phases of the buying process, and how leads will be routed throughout the organization. Once I tried to implement advanced lead management processes without the budget to buy a Marketing Automation system. That was hard. 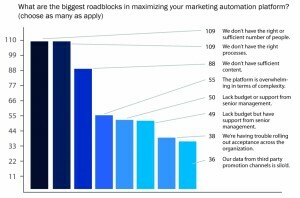 Actually, I felt frustrated that the lack of good technology was holding me back: it’s wasn’t just a lot of extra work, but certain features like behavioral lead scoring are simply not possible without Marketing Automation. To get the full benefits, Marketing Automation software and more effective Lead Management processes should be implemented at the same time. The top three issues are people, processes and content. Marketing Automation and Lead Management are complex, so you need to have someone in your organization who has experience with this. The most junior person on the marketing team is often not the right person. If you don’t have the right resources, you may need to hire someone, or work with a consultant. Once you have the expertise in place, you can also design the right processes. This is usually a collaborative effort between marketing and sales. The third roadblock from the survey was insufficient content. However, many organizations have more good content than they realize: check old blog posts, recorded webinars and other valuable content. But usually, it also requires a renewed focus on creating content that focuses on the buyer’s issues, rather than your own products. With people, processes and content in place, you are well on your way to Marketing Automation success! This entry was posted in lead management, marketing automation on October 18, 2010 by Jep Castelein. Hope all is well! So nice to read that someone else is thinking about Process this way. I admit it freely – I’m a process bigot and genuinely believe that everything is a process and every process can be improved using the Continuous Process Improvement Mantra of: Think, Plan, Do, Measure and Repeat.